If your office experiences high foot traffic levels, then your carpet will feel the brunt of it. To ensure it lasts for years, choose one that is stain resistant and can withstand that much traffic. A low-quality carpet will fade fast if it undergoes that much punishment. Therefore, you can get better value for your money if you invest in a high quality one. That one will last for years and will look good as new with proper and regular maintenance. 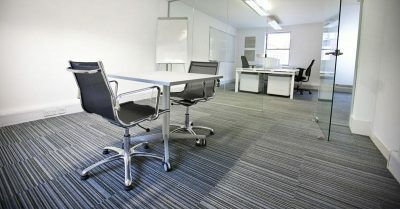 A low profile carpet is always a better option for any office. Since it has a shorter pile, it allows office chairs to slide across it without getting stuck. It is also ideal for commercial setups that have large equipment in-house since they can be moved easily over it. A popular variety are looped berber styles since they are cut-pile carpets. A level loop would be perfect which basically refers to a carpet which has loops of the same size. Carpets that have different sized loops can be coarse and can snag on equipment and office chair wheels halting production in its tracks. A cut and loop is ideal for a home office since it provides a cozier look. The loops form a pattern on the carpet adding to the aesthetic appeal. If your office is filled with complex technology and machinery, then you need a carpet that can withstand that static. Most carpets have this capability already while heavy grade ones are designed for institutional facilities such as hospitals and labs. These types of carpets are special and are made to prevent static buildup which can otherwise cause a fire. If static is a problem and you cannot afford this carpet, consider increasing humidity levels to prevent it. Carpets should be replaced every 2 to 3 years but to ensure your office carpet lasts that long, it should be maintained regularly. Make sure to find out the cleaning requirements of the one you get and pass those instructions onto the cleaning crew. It will go a long way in ensuring it lasts for years and look good as new down the line as well. Get all of your commercial carpets cleaned from Extra Hands Services, Inc. We have a range of housekeeping services that are perfect for offices as well. Dial 816-994-8825 to talk to us.